Laurence’s customers chuckle and he glides to another table to share more wry wisdom and coffee refills. Like a number of staff at the Harrison Hot Springs Resort and Spa, Laurence counts his time here in decades, not seasons. While boisterous Whistler Blackcomb Ski Resort publicizes itself as an official venue for the 2010 Olympic and Paralympic Winter Games, its “older sister” resort at Harrison will be quietly offering spa treatments, curative cocktails and gentle humour—as it has for over a hundred years. 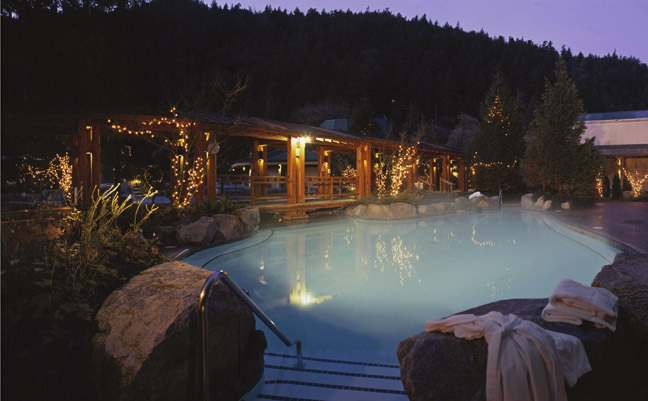 Like Whistler, the village of Harrison and its landmark Harrison Hot Springs Resort and Spa are nestled in a secluded mountain valley surrounded by glacial lakes and towering cedars. 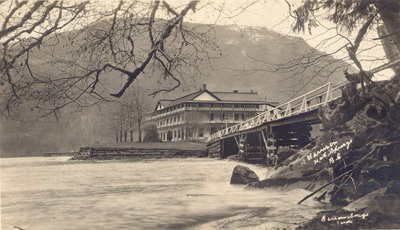 But rather than develop its slopes as a ski resort, Harrison decided to promote its unique hot springs. The scalding (65° C, 150° F) “St. Alice’s Well” waters gushed into Harrison Lake at a torrential rate and carried huge quantities of dissolved, “healthful” minerals. It was a tempting scenerio for 1890s era speculators and bathers. Early visitors arrived in the Fraser Valley by Canadian Pacific Railway, then negotiated a rough horse track through cranberry marshes. A local entrepreneur (made wealthy by the Klondike gold rush) built a three-storey hotel on the beach, a bathhouse pavilion at the spring, a series of “vapor” baths, and a scallop-shaped drinking fountain nearby. Over time the “health spa” expanded to become more of a “pleasure resort.” A fire razed the wooden hotel in 1920, but new owners rebuilt and expanded the property in 1926, and again in 1946. 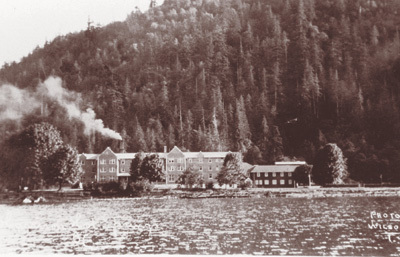 By 1950, the former St. Alice Hotel had become the grand Harrison Hot Springs Hotel with a billiard room, ballroom, tennis courts, bowling green, riding stables, golf course and “auto camp” cabins. The House of Seagram—once the largest liquor distillers in the world— assumed ownership in the mid-1950s, possibly due to the growing fame of The Copper Room. The dine-and-dance clubhouse featured a big-band orchestra, copper-plated grand piano, and a glass-tiled dance floor. Prime ministers (Mackenzie King), presidents (John F. Kennedy), kings (King of Siam) and movie stars (Clark Gable) snuck away to Harrison for time away from the limelight—sometimes mingling with surprised locals on the dance floor. Like Laurence, Saverio has been with the Harrison hotel for decades. 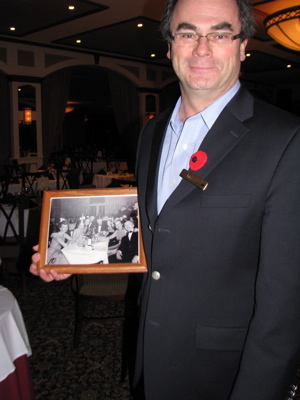 He started working at the hotel when he was 16 and follows in the footsteps of his father, who left Switzerland to work in Toronto and Montreal hotels in the 1950s. Hearing that the Harrison hotel was offering a whopping $1.50 an hour (compared to the current $.65 per hour rates), Saverio’s father moved his family west. Saverio still serves traditional-style Oysters Rockefeller and Rack of Lamb in the Copper Room, but these days he’s just as likely to suggest a locally-sourced Five Onion Bisque or Porcini Mushroom Agnolotti. As with the dining room’s menu, the Harrison Hot Springs Resort and Spa is experiencing a renaissance. Its newest owners (family-run Delaware North Companies Parks and Resorts) have invested nearly $15 million into restoring the historic getaway; and more than $400,000 in the Copper Room alone. The 400-seat room’s lush new decor oozes elegance for the next generation of cocktail sippers. And after Saverio and his team have cleared the linen tables of the evening’s Table d’Hote, a velvety dance band still propels guests onto the dance floor for some cheek-to-cheek. Caroline began as a massage therapist at the Harrison hotel’s Healing Springs Spa immediately after she graduated and—almost a decade later—she’s still there and still loves what she does. “It’s the people,” she says of both the hotel’s staff and clients. Though she hadn’t treated a movie star herself recently, she did share that Liam Neeson had spent an entire day in the spa during a film shoot. With a huge list of treatments and therapies to choose from, it’s not difficult to imagine spending an entire weekend inside the warm curves of the spa pavilion. True to tradition, the facility still offers private therapeutic sessions in its bath suites; as well as a social soak in its steaming series of fern-lined outdoor pools. Afterwards, the hotel’s fireside upper lobby makes it difficult to distinguish between newsmakers and newlyweds. Guests in thick white robes casually mingle, play checkers, and read newspapers like members of a social club. A spigot near the hearth hints of a time when visitors could take a cup of “curative” water from St. Alice’s Well. Today, spa staff are more likely to send you off with a lemony mug of chamomile-mint tea. Wander over the thick carpet to the coffee shop and you’ll meet “Miss Margaret.” Eighty years ago, the beloved hotel manager worked tirelessly to create a warm and welcoming place. Her portrait now hangs on the café wall and—the moment you sink your teeth sink into a buttery mouthful of honeyed, apricot granola bar—you’ll understand why the café is named for her. The treat is made in-house, and like the lemony tea, soothing massage, splash of coffee and other little personal touches of this heritage hotel, it is homey and luxurious at the same time. Fans of ski sports, night clubs and crowds may rush to Whistler’s mountains in 2010 for a piece of Olympic action, but you’ll find the rest at Harrison Hot Springs: chin-deep in a natural hot spring, sipping cocktails and sharing gossip about movie stars. 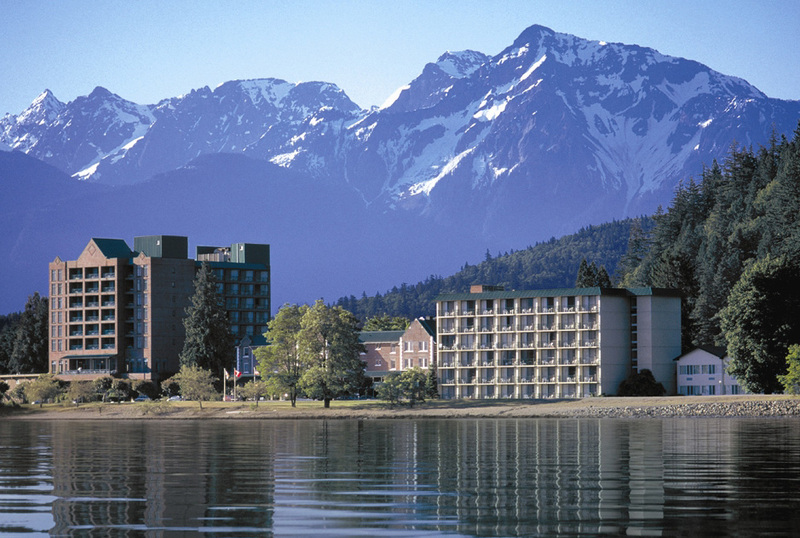 Harrison Hot Springs Resort and Spa and Harrison village are in southwestern BC, Canada. They are 133 km (84 miles) east of Vancouver, BC and 255 km (158 miles) north of Seattle, WA. Additional Harrison Hot Springs Resort & Spa vacation packages include Bed & Breakfast, Harrison Getaway, Festive Family, Girlfriends’ Spa and Romance specials. Visit Tourism Harrison for other Winter Games getaway packages in Harrison Village. ← Does Cycling Make Me Sick?